It's Ribbon Reel Challenge time! Helen is hosting and she has chosen a beautiful inspiration photo and asked that you use the colors in the photo, lace, ribbon, twine and flowers. I started with a a cream card base onto which I added my patterned paper. I stamped a frame onto a die-cut and cut in half adding at the top and bottom of my card. I added a sentiment to the bottom and embellished the top die-cut with satin angel wings, aqua button, and twine. Pulling inspiration from the photo, I stamped and die-cut a tea cup in pink, gingham paper which I added a snippet of crochet trim and a button. While on the subject of snippets, I took some leftove pieces and created banners and placed below the teacup before placing in the center of my oval circle. Lastly, I created a fussy bow out of Beige Seam binding and embellished with a twine bow and tea rose. Below is the beautiful inspiration photo. 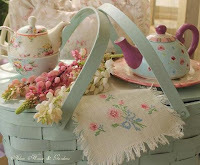 so pretty and i love that little teapot..
Beautiful card!! !Love your paper,colors are awesome!!! Sigh...this is just dreamy Tammy! You have a way of working magic with these shabby creations. I LOVE the split labels and doilies at the top and bottom. Amazing card girl!!! This is gorgeous! I loveeeeeeeee the colors and the teacup!! Oh....gorgeous! Love the colors and photo, very gorgeous. Think I see a card in my future with half cut die cut frames, love that! What a gorgeous card! The color combo is just amazing! Love the details Tammy!! This is over the top gorgeous! I love all the details you added. Oh wow Tammy.. this is beyond gorgeous! Absolutely stunning my friend!! I just love everything about this.. thanks so much for joining us this week at Jo's Funday Friday Challenge! Just GORGEOUS, Tammy! LOVE the teacup and the way you cut the mat in half for the top and bottom! LOVE the bow and the tea rose! Just stunning! A gorgeous card Tammy. Beautiful design - love the clever way you have used the die cut and all your embellishments are so pretty. Very pretty, Tammy! I like how you split the label and put the sentiment in the bottom part. Pure vintage beauty! Love this! gorgeous! i love what you do with ribbon Tammy! so lush! DeNami Design Summer Splash Blog Hop! God Bless America and Giveaway Winners! 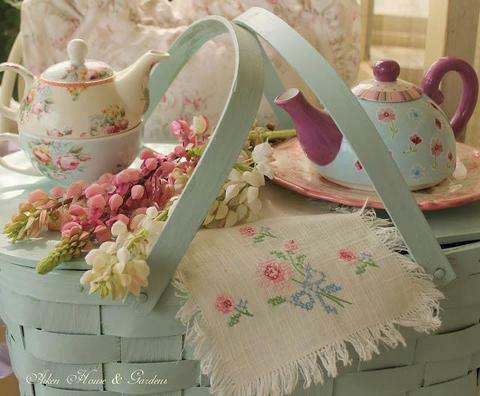 Guest Designing at The Shabby Tea Room!